If it feels like only last month that John Maclean’s acclaimed western ‘Slow West’ was in cinemas, you’re not imagining things. After opening at the Sydney Film Festival, the film had a short theatrical release and now comes swiftly to Blu-ray. It’s a clever new strategy - with so many great independent films being produced around the world and so few opportunities for audiences to see them outside of major cities, a quick home video release means a greater chance of connecting with audiences. And ‘Slow West’ is such a wonderful film, it deserves just such an opportunity. Scottish teenager Jay Cavendish (Kodi Smit-McPhee) finds himself caught in the pull of mysterious rogue Silas (Michael Fassbender) as he crosses Colorado in 1870 in search of his lost love Rose (Caren Pistorius). Jay is determined to find her, unaware that Silas is also after Rose and her father - something Silas decides to keep a secret and use the boy to get his prize. While so many westerns crumble under the weight of a brooding tone and dense psychology, ‘Slow West’ surprises with a black sense of humour and a cracking wit, executed with incredible visual style. Maclean and cinematographer Robbie Ryan take a compositional approach, so that the film feels more like a cheeky tone poem or bizarre picture book than a realistic western. The film was shot in New Zealand, but this doesn’t distract one bit, instead adding to the unusual quality of the film. The landscape itself is as much a character as those travelling across it, but somehow Maclean and Ryan capture it with the same twisted dry wit. Jay and Silas’ story is a kind of fable, simply told and filled with colourful characters, so it never overstays its welcome, and the comfortable ease of the storytelling keep you on the edge through many a twist and turn. The performances are wonderful across the board, especially from the two leads. It’s a great surprise at how much chemistry Smit-McPhee and Fassbender have, and the ensemble around them are also terrific, especially Ben Mendelsohn as Payne, an unexpected figure from Silas’ past. The film culminates in a tremendous finale, one of the most beautiful shoot-outs on screen in a long while, bursting with drama and colour. While so many westerns crumble under the weight of a brooding tone and dense psychology, ‘Slow West’ surprises with a black sense of humour and a cracking wit. ‘Slow West’ is an intriguing and haunting film, filled with originality and striking visuals. John Maclean has made a terrific addition to the western genre as well as a fascinating variation on it, demonstrating an exciting new voice in world cinema. It’s one that stays with you, mulling in your mind, recalling its beautiful images and memorable characters. I suspected that ‘Slow West’ would look terrific in high definition, and Transmission have not proved me wrong. Their 1080p 1.78:1 transfer looks wonderful, with razor-sharp clarity and exploding with colour. So much care and attention went into the look of the film, and this Blu-ray release really shows off that hard work. It’s one of the finest visual presentations of an independent film I’ve seen on Blu-ray in a while. The same can be said for the robust DTS-HD MA 5.1 track, which has a surprising amount of kick to it. The sound design and score are quite hypnotic, and they’re balanced perfectly here with the dialogue. The only extra included here is a short (7:23) but surprisingly rich featurette, including interviews with Maclean and the lead actors. What comes across is the enthusiasm from those involved for the project, not just for the film itself but the cast involved. They also discuss working with Maclean and the importance of the visual storytelling. The 'Slow West' competition has now closed. Winners will be announced shortly. Competition opens at 5pm AEST on Sunday 26th July 2015 and closes at 11:59pm AEST on Sunday 2nd August 2015. Five winners will be chosen at random on Monday 3rd August 2015. To successfully win, entrants must fulfil the above entry conditions before the time the competition closes. Current members/followers are eligible to enter the competition. Only one entry per person. Only one winner per household. To be a valid winner, the entrant must not have won a prize from SWITCH within the last 28 days. 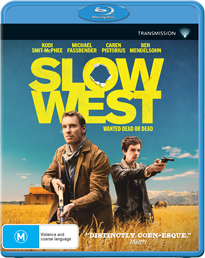 Each winner will receive one Blu-ray copy of 'Slow West'. By entering, you agree to receive occasional emails from SWITCH in the future. If you decide to unsubscribe from these updates, any further entries will not be applicable. Only Australian residents are eligible to enter. 'Slow West' is available on Blu-ray, Digital Download and DVD on Wednesday the 29th July 2015 from Transmission.